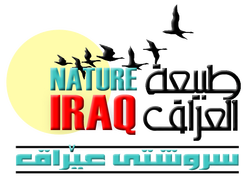 Nature Iraq, in partnership with the Water Right Foundation, has a new initiative under its Waterkeepers Iraq program. 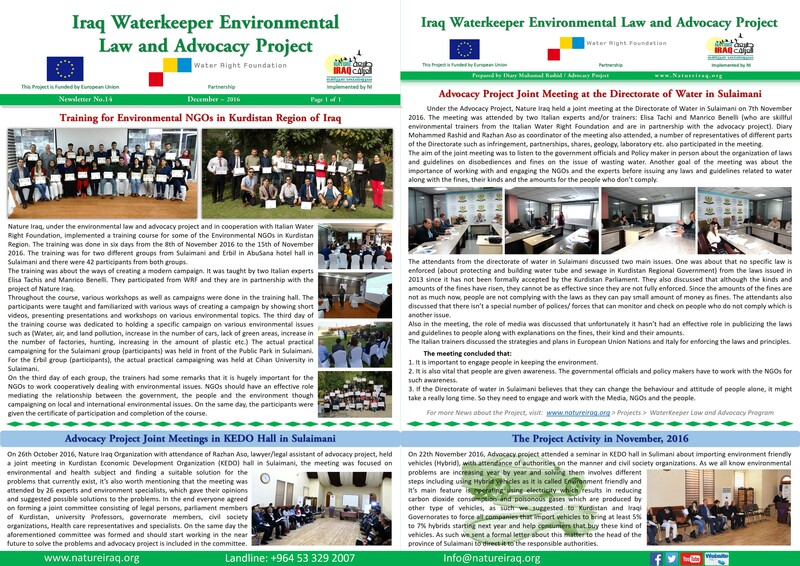 Over four years, the Iraq Waterkeeper Environmental Law and Advocacy Project, funded by the European Union, will seek to facilitate a culture of civil society and environmental protection in the Kurdistan Region of Iraq. 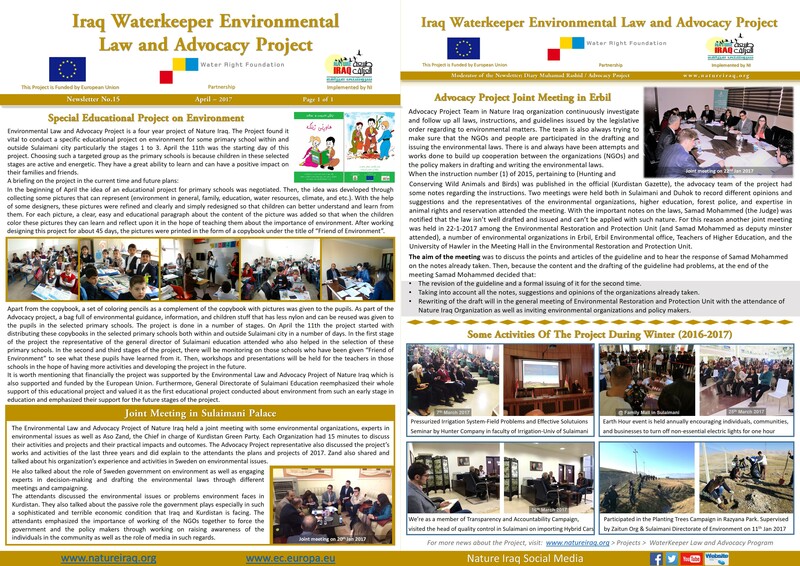 The Iraq Waterkeeper Environmental Law and Advocacy Project will bring together government officials, civil society organizations, and community representatives to increase engagement with the Kurdistan Region’s environmental laws. 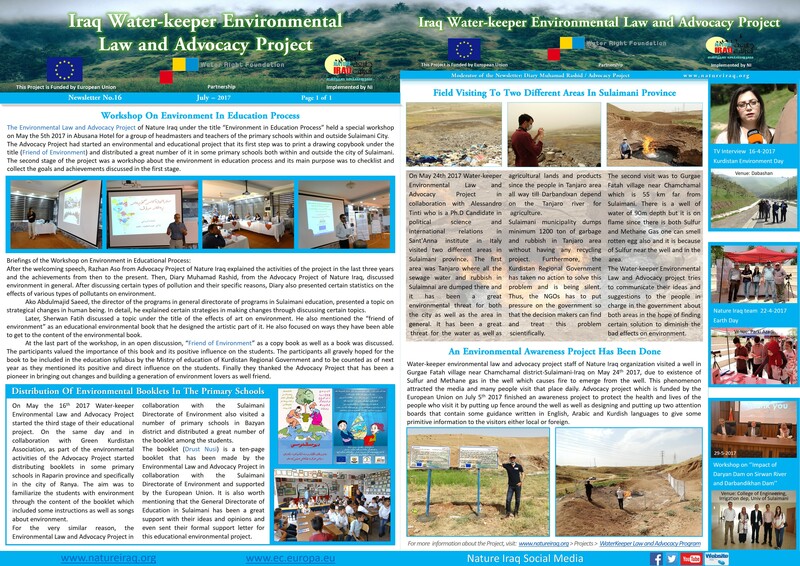 A series of trainings and meetings as well as the creation of a website, newsletter, and set of multi-lingual guides on the environmental laws of the Region, will bring together these diverse groups through the common interest of preserving water resources and ensuring a clean and healthy future for the next generation. 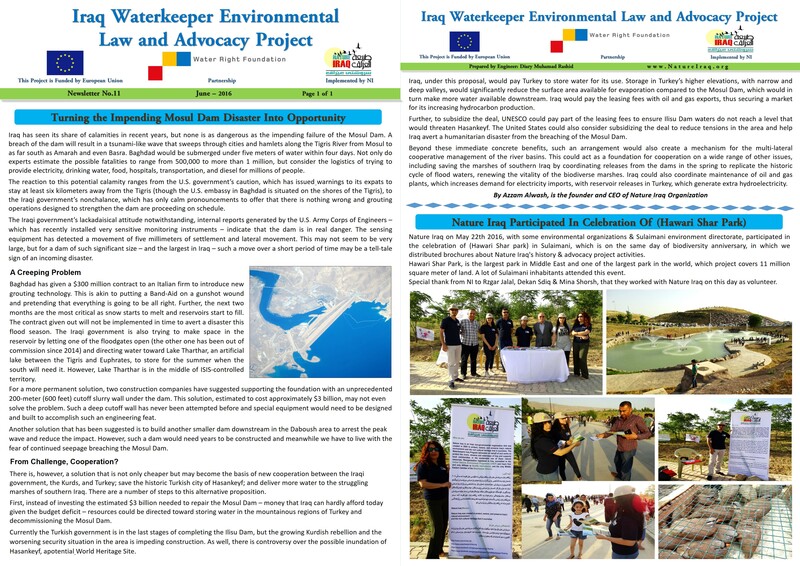 For a more detailed explanation of the project, please see the Waterkeepers Iraq website here. 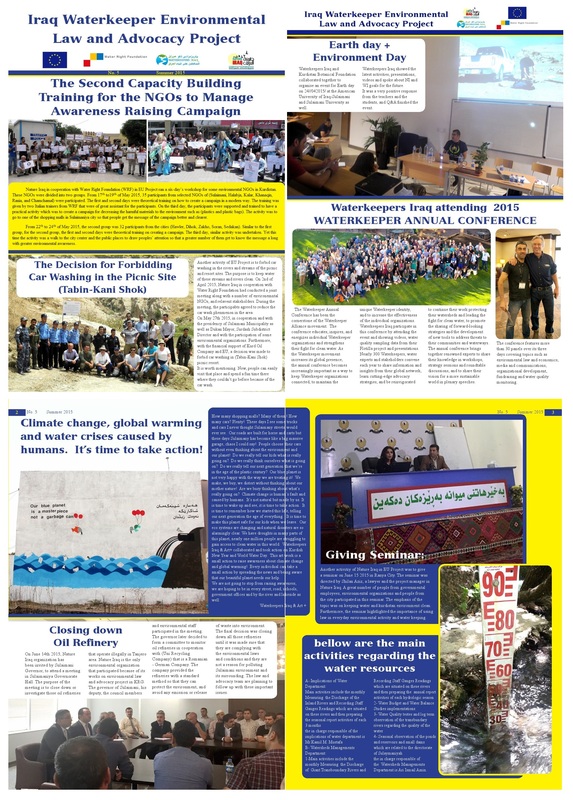 Local populations suffering from environmental degradation. 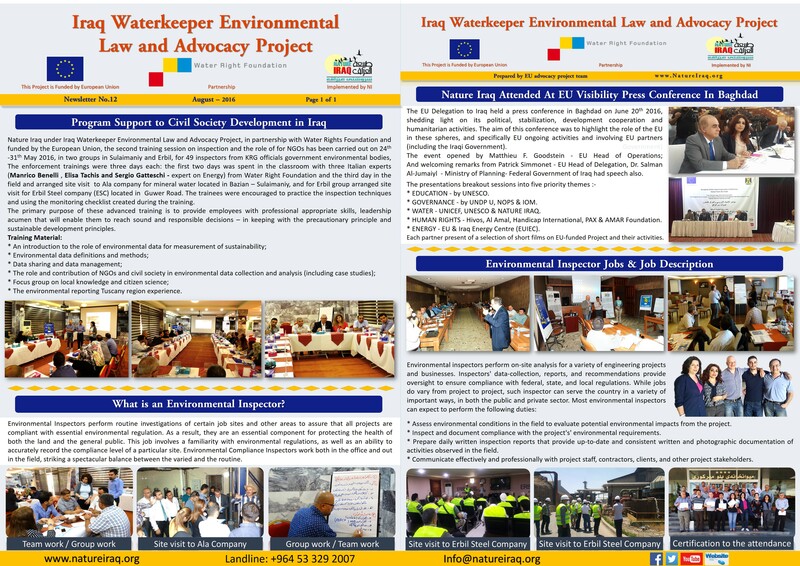 Improve participation and feedback between CSOs, the public and government in the process of developing effective environmental laws and regulations. 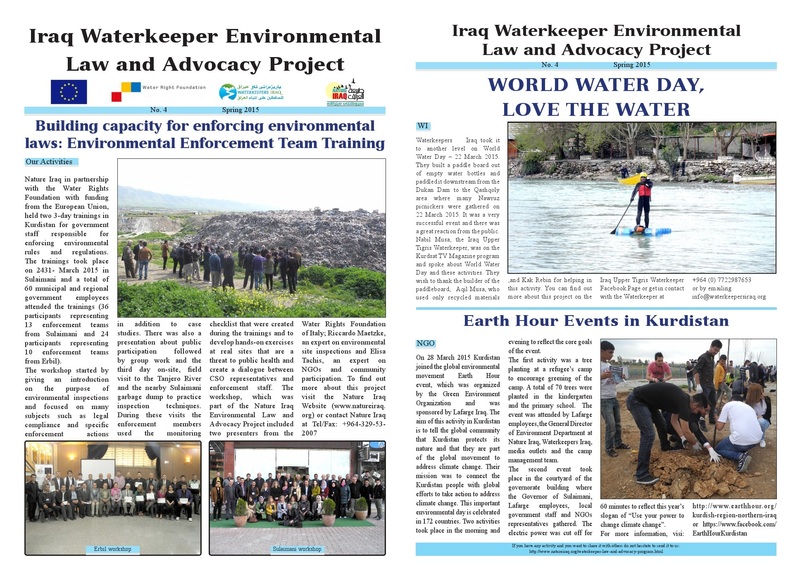 We are a diverse group of skilled employees including lawyers, Waterkeepers and communication officers who work on the Iraq Waterkeeper Environmental Law and Advocacy Project. 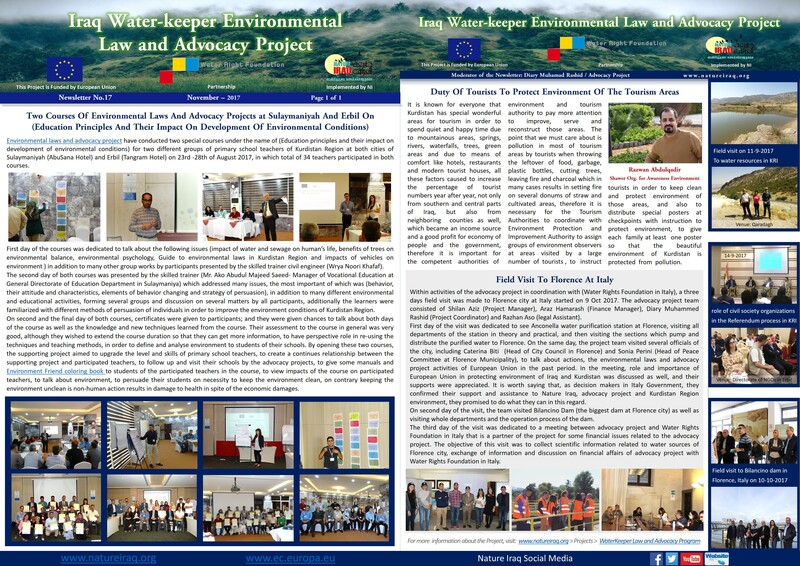 Together with our Italian partner Water Right Foundation, we are excited about this new project and will do our utmost to achieve its success. 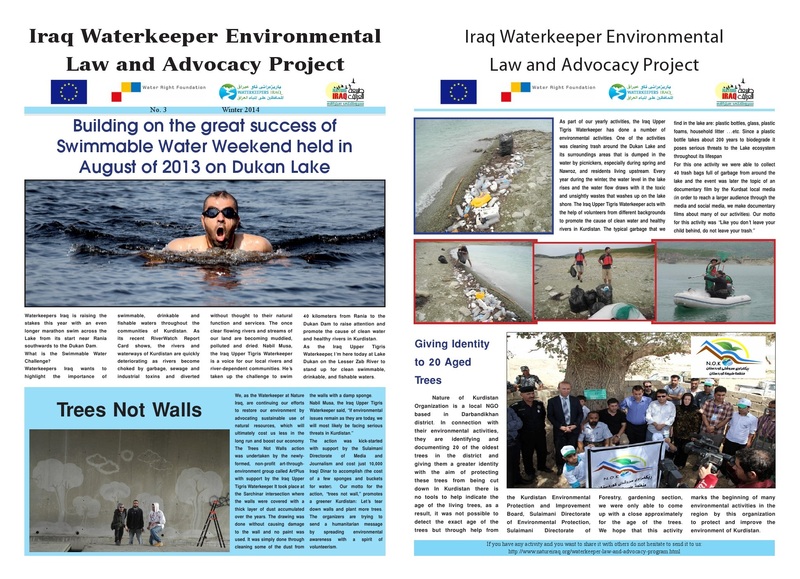 The Iraq Waterkeeper Environmental Law and Advocacy Project is funded by the European Union. 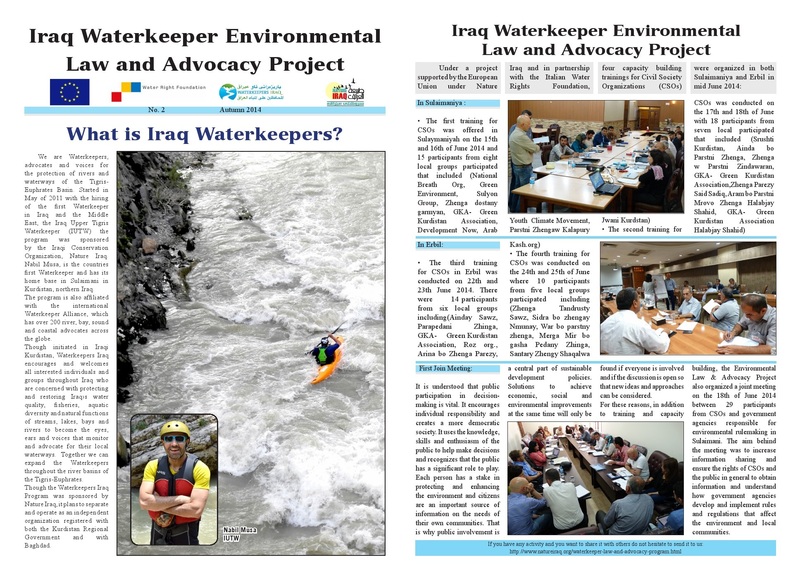 Waterkeepers Iraq, a program of Nature Iraq, seeks to advocate for and work to protect the rivers, streams and waterways of Iraq and support local communities in the sustainable use of these natural resources. 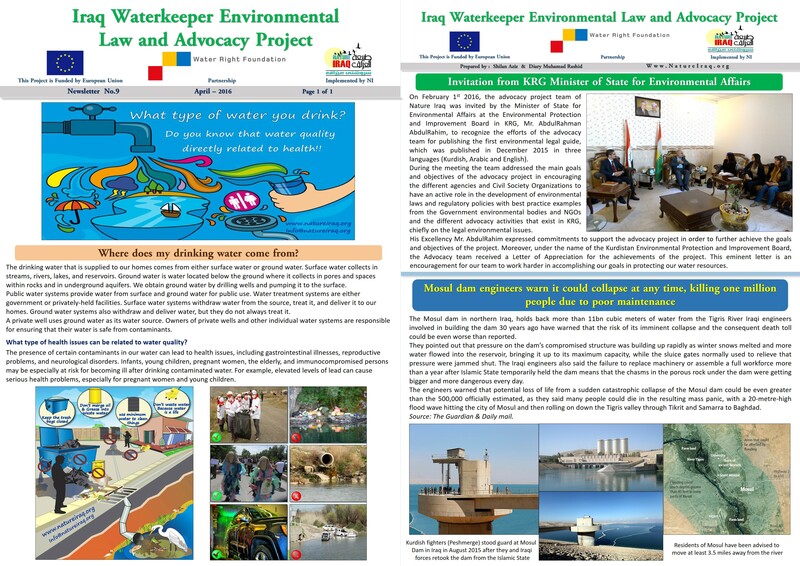 The Iraq Water Keeper Environmental Law and Advocacy Project, a project of Nature Iraq, recently created a user-friendly guide on the environmental laws of KRI & Iraq for the three major components of the environment; water, air, and soil, as well as the living elements of the plant and animal. 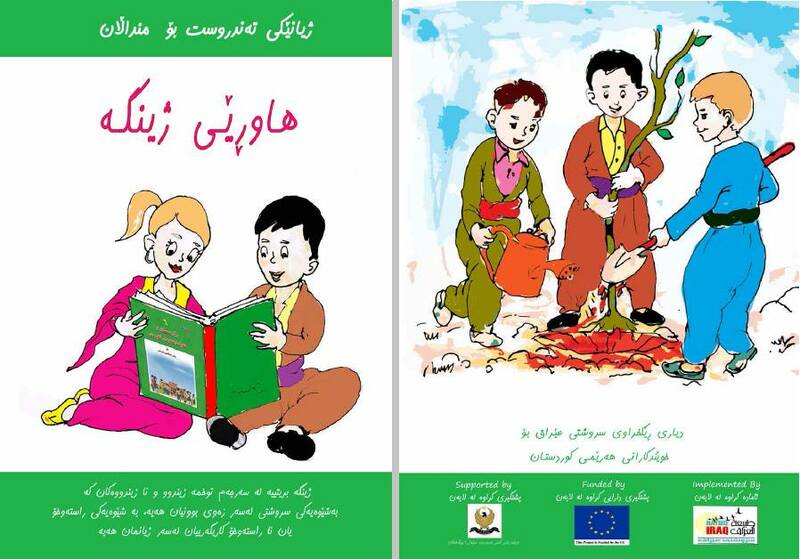 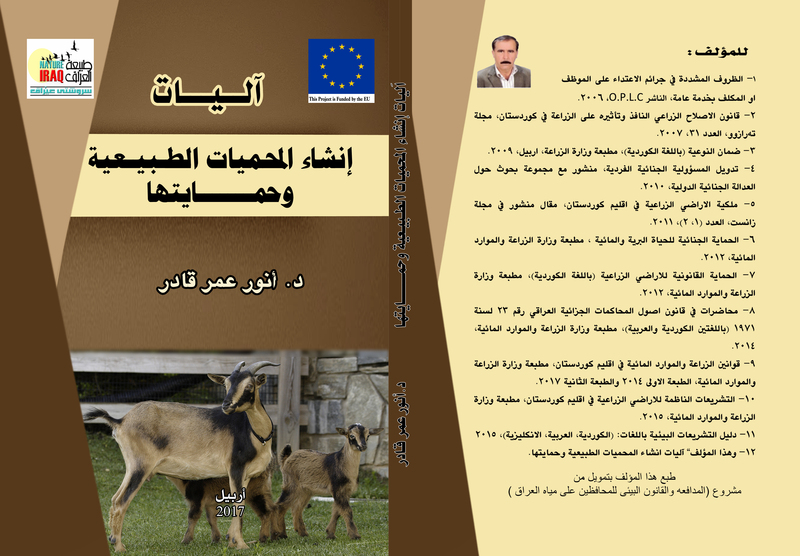 This guide written in three languages (Kurdish, Arabic and English) explains the basic environmental laws of the country and the region and the rights of its citizens to take action. 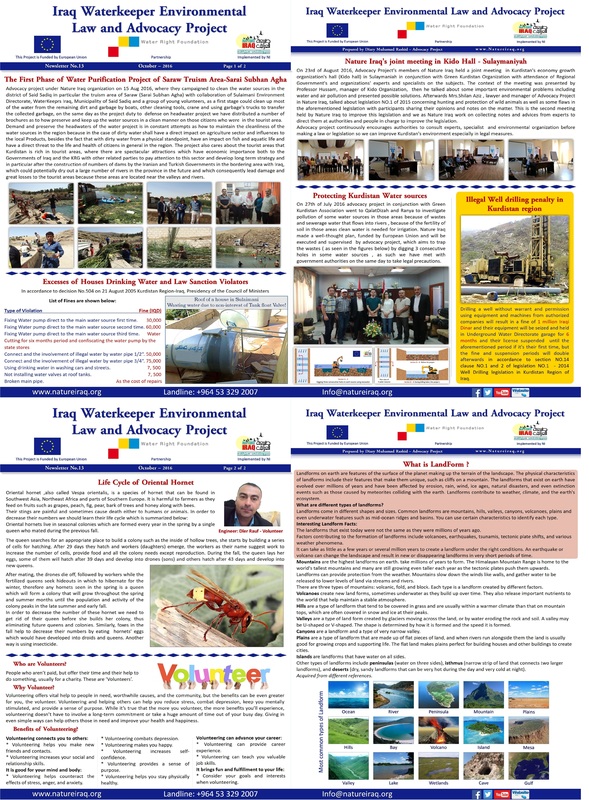 The 1000 copies printed in both Kurdish and Arabic, will be distributed to at least 500 community and civil society members interested in and/or working in the field of environment and public services. 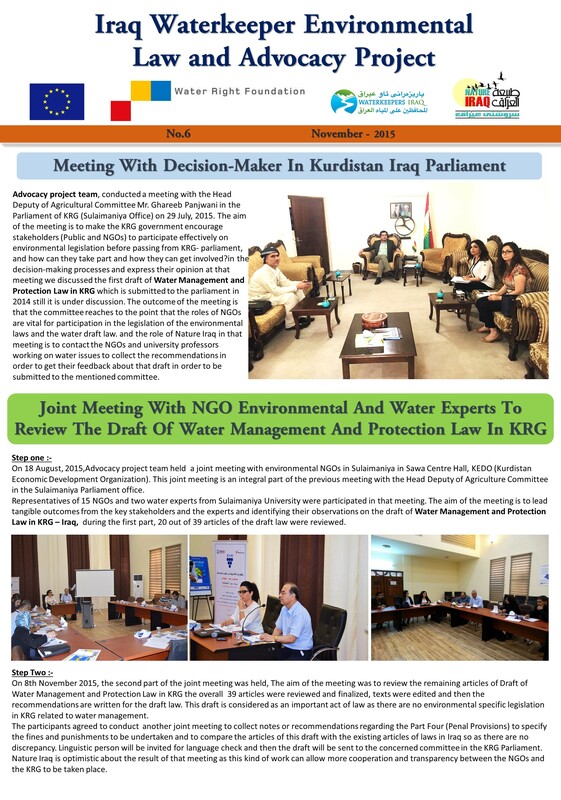 This guide was prepared by Nature Iraq legal staff: Shilan Aziz Salih & Razhan Aso Ali , under direct supervision of Dr. Anwar Omer Qadir ( Director General of Planning and follow up of the Ministry of Agriculture and Water Resources ) in KRI. 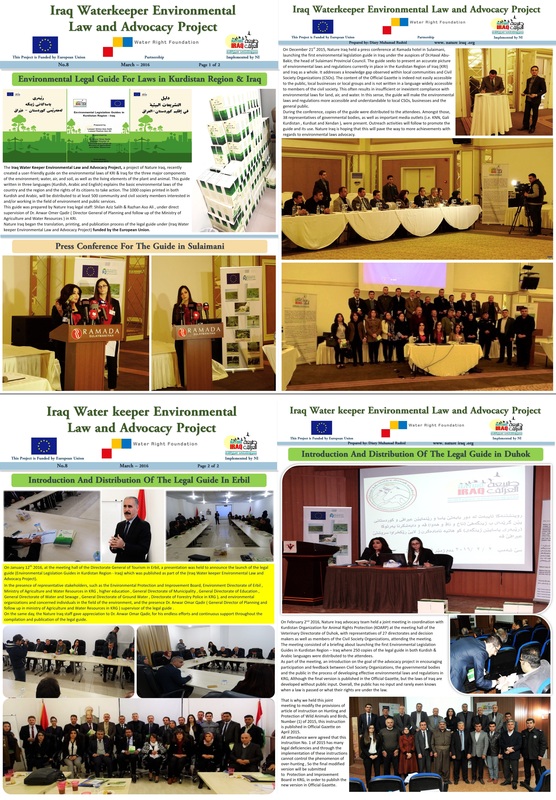 Nature Iraq began the translation, printing, and publication process of the legal guide under (Iraq Water keeper Environmental Law and Advocacy Project) funded by the European Union. 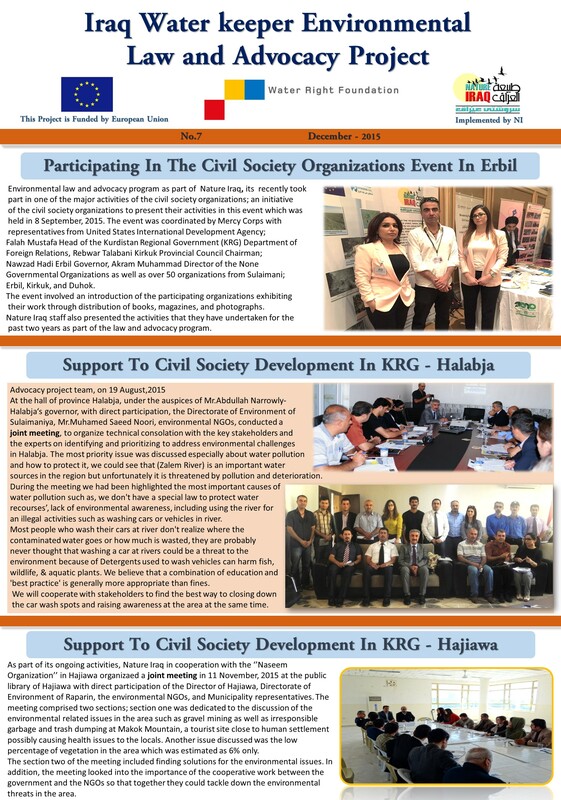 ​To see The Newsletters in PDF format, click here. 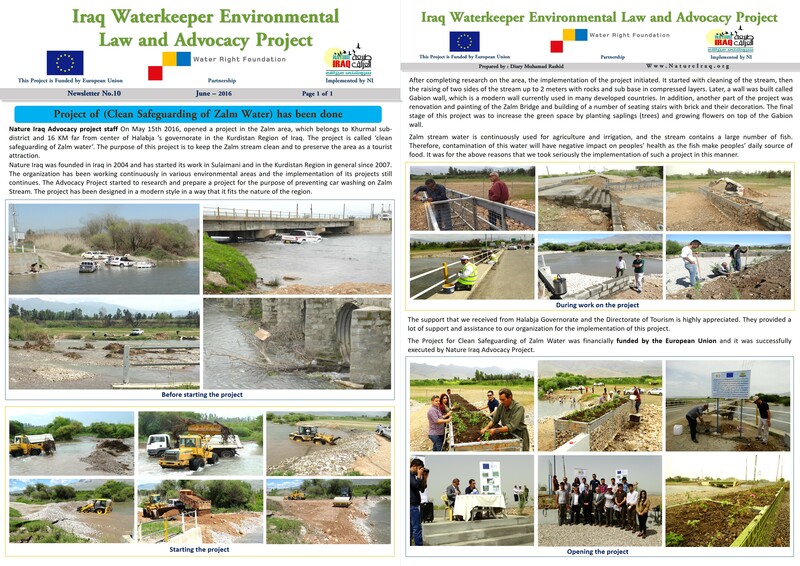 We will be posting updates about the project activities on this website over the course of the four year project. 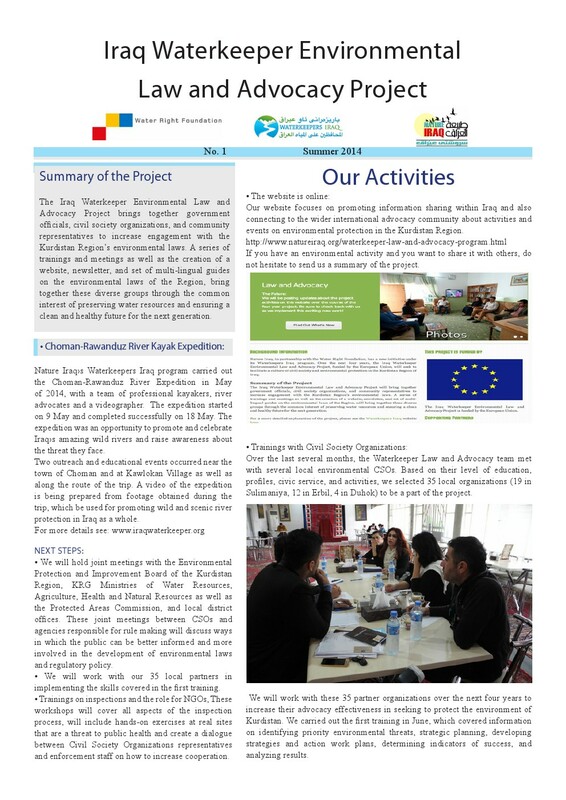 Be sure to check back with us as we implement this exciting new work!